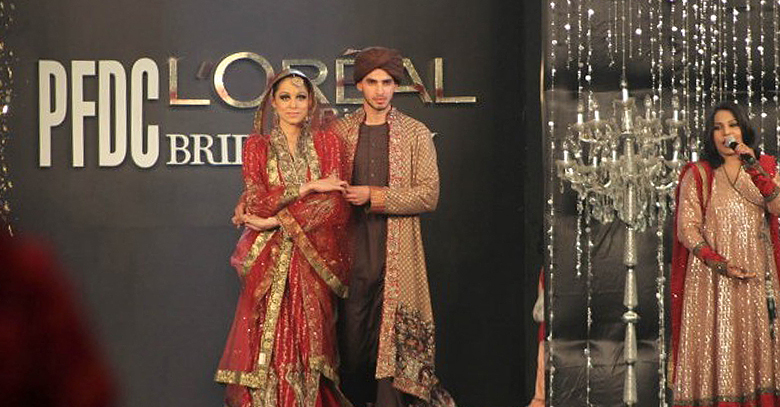 Its seems that Fall 2013 will be as memorable as the last two ones for Pakistan’s fashion industry as models adorning ghararas and lehngas, with flawless hair and makeup, sparkling diamonds and sapphires will bring out the bride within them at PFCD L’Oreal Paris Bridal Couture Week 2013. Once again, World’s top beauty brand “L’Oréal Paris” and “Pakistan Fashion Design Council (PFDC)” unite for the third edition of PFDC L’Oreal Paris Bridal Week. The much awaited fashion gala of the year is scheduled to be held in Lahore from October 10th to 12th, promising three days of absolute glitz, style and glamour. Around sixteen fashion designers will present their stunning bridal collections, showcasing an exotic fusion of present day and traditional trends of Pakistani Bridal fashion. The platform will also feature the latest designs of bridal jewelry and top make up trends. Teams of three prominent creative stylists and make-up gurus have will conceptualize the event. One of the much celebrated fashion brand “The House of Kamiar Rokni” is all ready to set the ramp on fire at PFDC L’Oréal Paris Bridal Week by launching its new bridal collection “The Orientalist’”. The three legendary figures of the fashion house “Kamiar Rokni”, “Tia Noon” and “Rehan Bashir” crafted the bridal line. Each of them has added their own flavor and diversity to the designs, in order to sync the ideology of the brand with the essence of the bridal week. For the past two years, PFDC and L’Oreal Paris BCW has been celebrating the culture, elegance and originality of Pakistan. Till date, the bridal festival has housed almost thirty Pakistani fashion masters and jewelry designers. Premium brands like Maria B, Karma, HSY, Asifa & Nabeel, Asim Jofa, Umar Sayeed, Layla Chatoor, Elan, Ali Xeeshan have showcased their collections on the prestigious platform. PFDC L’Oréal Paris Bridal Week is geared up to create yet another success story. The entire fashion industry has their fingers crossed to what the ultimate fashion celebration by L’Oreal Paris and PFDC will unveil this time.